Soviet foreign policy underwent a series of changes during the first decade of Stalin's rule. Soon after assuming control of the party, Stalin oversaw a radicalization of Soviet foreign policy that complemented his strenuous domestic policies. To heighten the urgency of his demands for modernization, Stalin portrayed the Western powers, particularly France, as warmongers eager to attack the Soviet Union. UIam entitled one of his books "Expansion and Coexistence", and there is no better period than that of the NEP to explain the significance of the title. Soviet policy in this era was conducted on two levels: While Chicherin was seeking de jure recognition of the Soviet Union as a state of the traditional type, the Comintern, financed by, dominated by, and housed in Moscow, was striving to subvert the very governments that the Soviet Union was "coexisting" with. "Expansion" in the 1920s and the 1930s meant the promulgating of the Communist doctrine throughout the world. It was not until the period of World War II that it came to mean the physical expansion of the Soviet Union. Although not spelled out by Ulam, the Soviets over the last half-century have reverted to "coexistence" whenever conditions were not propitious for territorial expansion. In the 1930s, Stalin, pessimistic about the prospects for revolution in Europe and having burnt his fingers in China when he tried an alliance with the national bourgeoisie, went for "socialism in one country." The 1930s saw the industrialization of Russia at a forced tempo and the concomitant collectivization of agriculture, with all the horrors engendered by that policy. During the early 1930s, Stalin for all intents and purposes followed an "isolationist" policy in foreign affairs. The diplomatic isolation practiced by the Soviet Union in the early 1930s seemed ideologically justified by the Great Depression; world capitalism appeared destined for destruction. To aid the triumph of communism, Stalin resolved to weaken the moderate social democrats of Europe, the communists' rivals for working-class support. Conversely, the Comintern ordered the Communist Party of Germany to aid the anti-Soviet National Socialist German Workers' Party (the Nazi Party) in its bid for power in the hopes that a Nazi regime would exacerbate social tensions and produce conditions that would lead to a communist revolution in Germany. Stalin thus shares responsibility for Hitler's rise to power in 1933 and its tragic consequences for the Soviet Union and the rest of the world. Events outside the Soviet Union, however, would not permit such a policy for long. The Japanese had moved into Manchuria in 1931 and were pushing hard against the borders of the U.S.S.R. and its satellite, Outer Mongolia. Hitler came to power in Germany, and even a cursory perusal of Mein Kampf was enough to show his ambitions vis-á-vis the Ukraine. To any Russian leader, Tsar or Commissar, the worst of all possible worlds is one in which both ends of the empire are under hostile pressure. Sheer logistics makes a two-front war a Russian nightmare. Under these conditions Stalin opted for "collective security" with Britain and France and went so far as to join the League of Nations, hitherto referred to in Moscow as the nest of capitalist bandits. The Comintern now directed the various Communist parties to ally with any group that was "antifascist," be it the Kuomintang, the British Tories, or the French bourgeoisie. The dynamics of Soviet foreign relations changed drastically after Stalin recognized the danger posed by Nazi Germany. From 1934 through 1937, the Soviet Union tried to restrain German militarism by building coalitions hostile to fascism. In the international communist movement, the Comintern adopted the popular front policy of cooperation with socialists and liberals against fascism, thus reversing its line of the early 1930s. In 1934 the Soviet Union joined the League of Nations, where Maksim M. Litvinov, the commissar of foreign affairs, advocated disarmament and collective security against fascist aggression. In 1935 the Soviet Union concluded defensive military alliances with France and Czechoslovakia, and from 1936 to 1939 it gave assistance to antifascists in the Spanish Civil War. The menace of fascist militarism to the Soviet Union increased when Germany and Japan (itself a threat to Soviet Far Eastern territory in the 1930s) signed the Anti-Comintern Pact in 1936. But the West proved unwilling to counter German provocative behavior, and after France and Britain acquiesced to Hitler's demands for Czechoslovak territory at Munich in 1938, Stalin abandoned his efforts to forge a collective security agreement with the West. International events of the late 1930s showed the power of external ideologies and threats. Waiting for impending war was literally poured into the air, sounded in the official appeal: "Every young person must continually bear in mind that our country is in a hostile environment. Strengthening national defense, relentless mastery of military equipment, assistance in active radical improvement work osoaviahimovskih and athletic organizations, mobilization readiness of the sacred duty of each and every young Komsomol member. So this ideologey was interpreted at the local level: "Let them remember the Nazis as Stalin says, we want peace, but we are not afraid of threats and will respond double blow for blow warmongers. Let the Germans will remember these words of Comrade Stalin, and shoved his pig snouts into our Soviet garden...."
Report by Joseph Stalin, General Secretary, to the Plenum ( Plenary Session ) of the Central Committee of the Communist Party of the Soviet Union, March 3, 1937. "Capitalist encirclement -- that is no empty phrase; that is a very real and unpleasant feature. Capitalist encirclement means that here is one country, the Soviet Union, which has established the socialist order on its own territory and besides this there are many countries, bourgeois countries, which continue to carry on a capitalist mode of life and which surround the Soviet Union, waiting for an opportunity to attack it, break it, or at any rate to undermine its power and weaken it. " 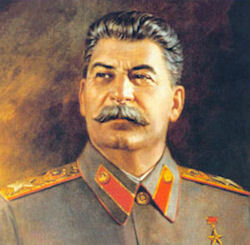 Convinced now that the West would not fight Hitler, Stalin decided to come to an understanding with Germany. Signaling a shift in foreign policy, Viacheslav Molotov, Stalin's loyal assistant, replaced Litvinov (who was Jewish) as commissar of foreign affairs in May 1939. Hitler, who had decided to attack Poland despite the guarantees of Britain and France to defend that country, soon responded to the changed Soviet stance. While Britain and France dilatorily attempted to induce the Soviet Union to join them in pledging to protect Poland, the Soviet Union and Germany engaged in intensive negotiations. The product of the talks between the former ideological foes--the Nazi-Soviet Nonaggression Pact of August 23, 1939--shocked the world. The open provisions of the agreement pledged absolute neutrality in the event one of the parties should become involved in war, while a secret protocol partitioned Poland between the parties and assigned Romanian territory as well as Estonia and Latvia (and later Lithuania) to the Soviet sphere of influence. With his eastern flank thus secured, Hitler began the German invasion of Poland on September 1, 1939; Britain and France declared war on Germany two days later. World War II had begun. The moral of Ulam's tale from Brest Litovsk to the present would seem to be that when the security of the Soviet regime is in danger, ideological enemies are welcome as allies. Nowhere was this better demonstrated than during the 1939-41 period. By early 1939, Stalin lost confidence in his British and French allies and in rapid order signed the notorious Soviet-Nazi Pact (August 1939) and an agreement with Japan (spring of 1940). He then sat back to watch the slaughter as the fascist and the democratic capitalists made mincemeat of each other. In June 1941, however, his Nazi "friends" proved to be even more Machiavellian than he, and Stalin had no other recourse than to seek help from the democracies. Ulam points out that a Communist regime had more to worry about than just the security of the nation. It also had the problem of maintaining the leader's personal regime within the nation. Thus Stalin in the first eighteen months of the war with the Germans could not afford to trade space for time recklessly-he had to sacrifice millions of soldiers in an effort to minimize the German penetration as much as possible. German errors, Allied aid, and, to give the devil his due, Stalin's fortitude enabled the regime to survive the Great Fatherland War and emerge victorious. The Comintern, instrument of a world-wide Moscow-guided revolution, was an eyesore to the democratic allies; on the other hand, Stalin's hope and conviction that, under the guidance of the Comintern, popular uprisings would break out in any country that dared to wage war on the Soviet Union, had been deceived. In the spring of 1943, when the German armies were beginning to retreat and foreign emigre Communist leaders in Moscow were preparing to return to their own countries to take over control of Soviet-satellite governments, the open subordination of these leaders to the Comintern in Moscow was only too obvious. Teh rsult was was the dissolution of the Communist International after 24 years of existence. But Stalin never really intended to dissolve this useful organization. For a time it continued unofficially to exist, and remained highly active. The amendments to the Soviet constitution which were adopted in February 1944 greatly enlarged the jurisdiction of the individual Soviet Union republics. The amendments provided for the organization of military forces in each of the national units, and for separate foreign offices. Molotov told the Supreme Soviet on February 1, 1944: "This transformation signifies the great expansion of activities of the Union Republics which has become possible as a result of their political, economic and cultural growth, or, in other words, as a result of their national development. One cannot fail to see in this a new, important step in the practical solution of the national problem in the multi-national Soviet State, one cannot fail to see in this a new victory for our Lenin-Stalin national policy." Stalin's actual aim in this case was to acquire more than one vote in the projected United Nations. Since the British dominions were to be entitled to one vote each, Stalin tried to depict the Soviet's 16 Union Republics as sovereign states; the first attribute of sovereignty is an armed force and a foreign office. In this way the Soviet government obtained the agreement of its allies to the admission of the Ukraine and Belorussia to the United Nations as separate units; in all other respects the reforms stipulated in the constitution were a fiction. The "broadening" of activity which Molotov saluted in 1944 failed to develop. The Ukraine and Belorussia were represented in the United Nations where they provide two additional votes for the USSR, but none of the sixteen republics was permitted to exchange diplomatic representatives with foreign states or enter into agreements with them. On 26 June 1950, North Korea attacked South Korea. Stalin was operating on two assumptions: victory would be swift, and Soviet involvement would be purely technical. Both were wrong. And he needed a victory. He had won the Great Patriotic War, consolidated the new Soviet Empire, and produced an atomic weapon, but he had also had a string of losses — the failed attempt to blockade Berlin, losing control of Yugoslavia, the Americans stealing his thunder by makingthe first announcement of the Soviet bomb. He was aware that his power as a leader flowed from his demonstrated superiority, not only at the late-night Kremlin banquets but on the world stage. The men around him, especially the ambitious Beria, could turn against him if they sensed he was losing his vitality, charisma, cunning.